All of these steps should be done BEFORE painting to make sure you don't scratch your paint job while adjusting everything. 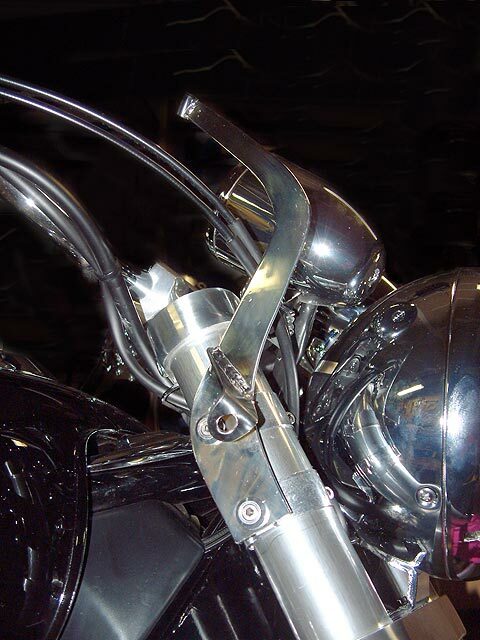 Using a metric allen wrench, remove the turn signals from the forks, and let them hang down behind the forks (a towel on the front fender for protection is a real good idea). Using the fork mount rings from the Memphis Shades kit (see photos at right) mount one ring 2" down from the top triple clamp and the other 3" up from the bottom triple clamp on each fork. Make sure the quick disconnect bolts are facing out. 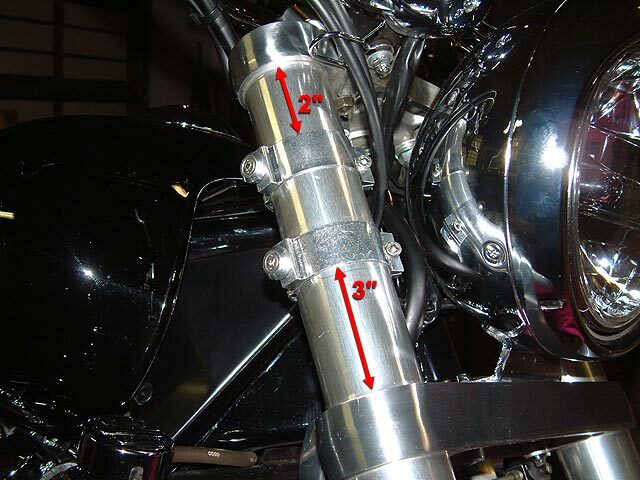 These distances are set so that your turn signals with be high enough to clear the radiator cap when turning the bars full right. In the photo at right you can see the assembled fairing on my workbench and in another photo you see the unit held up against the forks. 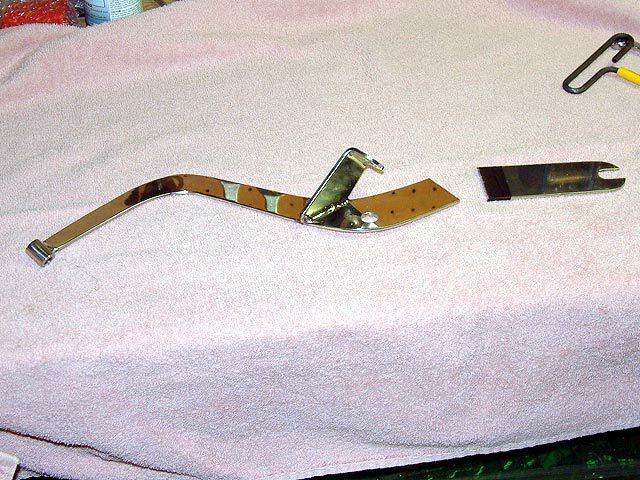 Obviously the stock brackets are way too long. Now each bracket will have only one fork mounting hole in it. You need to add another hole and also drill out the existing hole to 1/2"
The new bottom hole needs to have it's center drilled 1/2" up from the bottom of the bracket, and 3/4" in from the edge of the bracket. De-bur the holes and your ready to assemble the fairing. 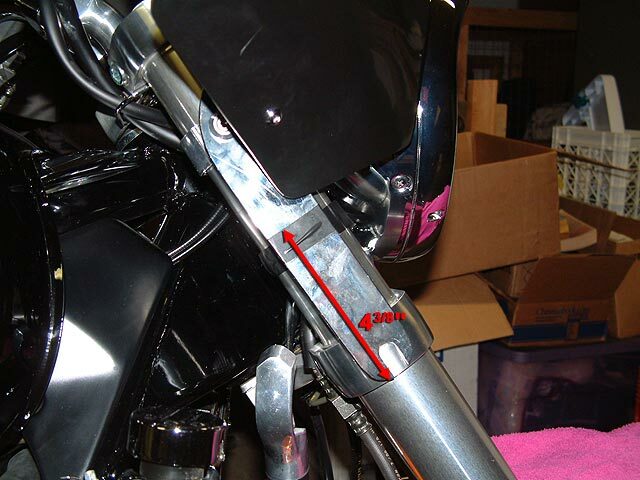 Just follow the instructions that come with the fairing to put the windshield on and attach the brackets. 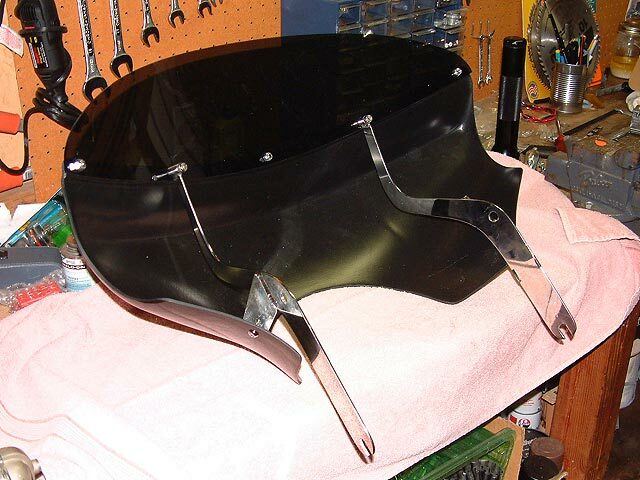 Now mount the fairing to the forks by first removing the 4 quick disconnect bolts on the fork mounted brackets, then line up the holes on the fairing brackets and replace the 4 bolts. If the holes are slightly off, you can adjust the brackets on the forks to line them up. Now replace the turn signals and mount them up against the underside of the bottom fork bracket. You will have in effect, lowered the turns signals a bit but kept them high enough not to smack the radiator cap. Now you're ready for a test drive. 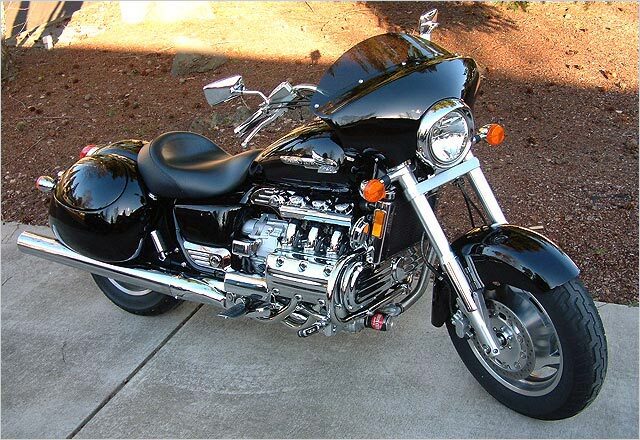 Now you just need to take the fairing back off and get it painted. I was amazed at how rock solid the fairing is once mounted on the bike. Dragbars told me his was steady at 162 MPH at Bonneville so I don't think I'll have any problem with mine!